Sid Gribetz presents a special five hour radio show celebrating the career of alto saxophonist Ernie Henry this Sunday January 17 from 2- 7 PM on "Jazz Profiles" on WKCR. Not well known even in his brief lifetime, Ernie Henry was a musician of astonishing grace, style and profound emotion. 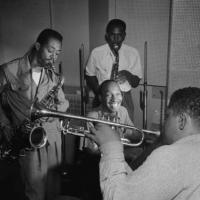 Henry came up in the bebop days and was a key member of Dizzy Gillespie's 1948-9 big band, and he also participated in the more lyrical side of bebop with Tadd Dameron, Fats Navarro, Howard McGhee, and Walter "Gil" Fuller. He spent the early fifties with his native Brooklyn beboppers, and as he turned 30 in 1956 he emerged full force on the scene, appearing on Thelonious Monk's “Brilliant Corners”, in Dizzy's famous 1956-7 edition of his big band, and in several virtuoso recordings as a leader on Riverside that seemed primed to send him to future stardom. Unfortunately, he died in his sleep from various ailments on December 29, 1957 at the age of 31.